The former pro basketball player discusses his foray into fashion and hip-hop, working with Kevin Gates, and his upcoming EP with The Elevaterz. Last year, Tree Thomas released a self-titled, six-track EP. 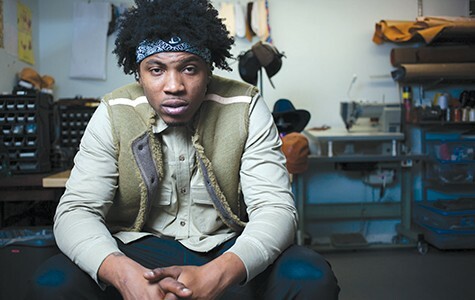 When I met up with emerging rapper Tree Thomas (born Phillip Thomas), at The Retail, a swanky menswear boutique in downtown Oakland, he was dressed in a sleek, beige button-down shirt and vest custom tailored to fit the former professional basketball player's 6-foot-8-inch frame. A cross earring dangled from one ear and a black bandana pushed back his afro, adding quirky details to his otherwise classic look. As we walked through the storefront to get to his music studio in the back, he greeted customers with a regal air. It was easy to tell he embraces his role as a brand ambassador. 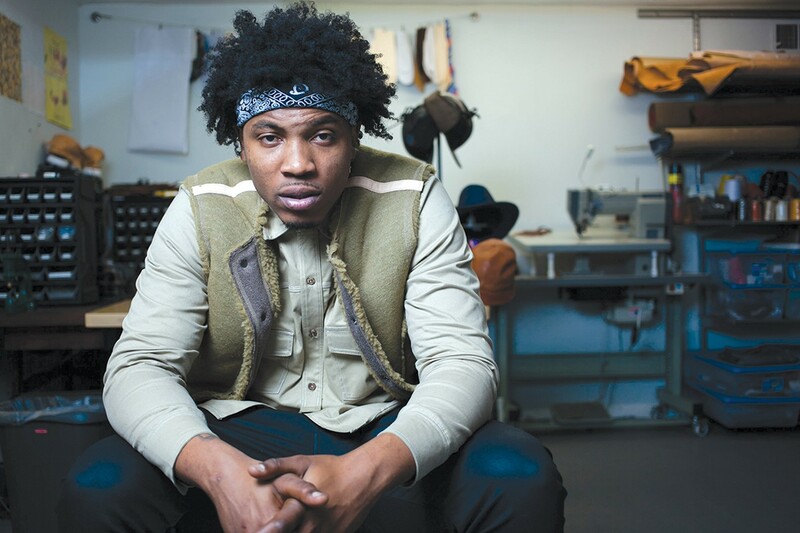 "I'm here every day helping with the brand and the clothing line and recording music," said Thomas, as I marveled at the hand-sewn leather bags and shirts hanging on the racks. "I try to put that same basketball grind that I had into the music, since I'm transferring over. I think it's all the same — the same hours you put in, the same work ethic, the same sacrifices." Outside of making music, Thomas helps run the Oakland-based fashion label Calculated Clothing. The brand's founder, Thomas' longtime friend Calculated Cal, recently opened The Retail on 15th Street next to the stretch of up-and-coming shops and galleries at the center of the budding Second Saturdays art walk. Thomas is a partner and unofficial design consultant for the new business, and his music studio is nestled in the back of the shop, behind Cal's workspace with its arrays of vintage sewing machines, sheets of dyed and distressed leathers, and sample clothing. Locally and nationally, the worlds of rap, fashion, and sports are more intertwined than ever this year. Marshawn Lynch, the newly retired Seattle Seahawks running back and Oakland native, just opened his Beast Mode athletic wear store in Old Oakland, and he's also been known to hang out with Mistah F.A.B. and E-40 and spit bars from time to time. East Bay rapper-turned-spiritual guru Lil B has taken to Twitter to leverage curses on several NBA players, which has added a layer of superstition to the Warriors' supernaturally successful season. And Richmond rapper IAMSU recently performed his new single, "Game Time," at halftime during the Sacramento Kings' game against the LA Lakers. This conflation of pop cultural realms is fertile ground for the 26-year-old Thomas' move into music and apparel. A few years ago, he was a college basketball player with a promising career ahead. After his 2012 graduation from Portland State University, he was recruited to the national team of Malta, a small island nation off the coast of Italy, where he lived and played professionally for nearly two years. Thomas had been rapping and making beats since high school, and he said that when he was living in Europe, his lax practice schedule afforded him plenty of free time to work on his creative practice. In Malta, he penned his debut mixtape, 2013's Peach Street, so named after the street he grew up on off 96th Avenue in East Oakland. After returning to the Bay Area two years ago, Thomas retired from sports and turned his full focus on his artistic and entrepreneurial endeavors. In 2015, he released a self-titled, six-track EP. While Peach Street included a smattering of Nineties-indebted beats with a jazzy flavor, on Tree Thomas, the rapper streamlines his focus toward a trap sound with a bass-heavy knock and layers of psychedelic instrumentation that bring out the melodic qualities of his otherwise rugged flow. While its beats come from several different producers, Thomas' vocals work particularly well over Trippy Sanders' productions, such as "Selfie$" and "D2D$," with wobbly, ominous synths destabilizing Thomas' otherwise straightforward rap style and adding a foreboding ambience. Meanwhile, on "4T$," which features IAMSU and Kevin Gates, a rising rap star from Louisiana, Thomas plays with Auto-Tuned rap singing in the hook — a style he's currently evolving for his upcoming album with the production crew The Elevaterz, whose credits include making beats for Berner, Migos, and Wiz Khalifa. Thomas' work in the fashion industry has landed him some important connections that helped him lay a solid foundation for his music career. His alliance with Gates, whose album Isaiah debuted at number two on Billboard earlier this month, has been particularly fortuitous. Gates found out about Calculated Clothing through mutual friends in the music industry, Thomas said, and eventually invited Thomas to perform with him at South by Southwest, the annual music festival in Austin, Texas, in 2014. Since then, Thomas has opened for Gates at several of his West Coast shows. While Gates was an emerging artist when they met, he's recently become one of today's most talked-about rappers. When he came to the Bay Area to perform at The Regency Ballroom in San Francisco last week, Thomas was his local connection, and Gates even spent time recording and hanging out in Thomas' studio in the back of The Retail. "It's been very inspiring and motivating ... being with him in the studio and seeing how he works," said Thomas. "He's a great thinker, he speaks what's on his mind at all times, and he's talented. It's good being in the presence of someone who's doing well and still being supportive." Currently, Thomas is putting finishing touches on his EP with The Elevaterz, which is now in the mixing and mastering phase. The project is still untitled, but Thomas said that it's due to come out later this spring. The snippets of it he played for me in the studio were more along the lines of his new single, "DYFH" — a Sanders-produced, brooding meditation about jealousy — than the hustling anthems of the Tree Thomas EP. His experimentation with singing and more melodic production has given rise to more sentimental, vulnerable lyrics, he explained. In addition to romantic relationships, many of the songs are about his new best friend: a pit bull he rescued last summer. "I'm a real emo dude when it comes to music, so a lot of my music is about relationships. That's when it's natural."